Rendered Concept Of Tela's Model S! Home / Automotive / News / Rendered Concept Of Tela's Model S! The Model S has received lots of praise for most of its features, but one thing that could be improved is its anodyne front end. 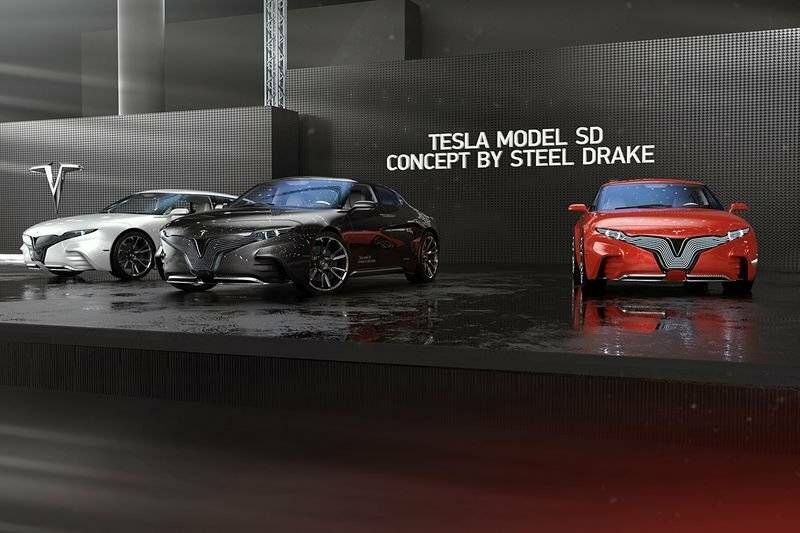 The designer Steel Drake came up with a render that looks nothing like Tesla's current models. Named the Model SD, it measures 4,925mm in length, 1,930 mm in width and 1,400 mm in height, which makes it slightly smaller in all dimensions than the Model S, although it is still very comparable in size. Among its most distinguishable features are the multicolour light strips at the front, the suicide door setup as well as the absence of a rear window, which probably means a camera system helping the driver see what is going on behind. A closer look also reveals that the headlights are hidden behind the front fascia, which is an interesting touch, unlike the rear door design with its small window and low visibility. We doubt Tesla would come up with something like this when the time comes to replace the Model S, but it is still a pretty cool render concept. Tesla You Mother Trucker You! Electric Truck Literally Does USA! Tesla Factory Tour With Elon Musk – How Exciting! When Using A Car Window As A Mirror Takes A Dramatic Turn!